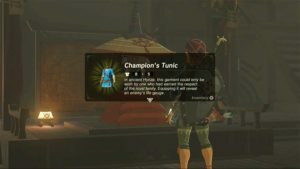 The Champion’s Tunic is a torso armor that Link can wear in Breath of the Wild. This tunic is the armor that can you find in the front cover of the game as well as several artworks featuring Link. Once equipped, Link can now see the enemy’s life gauge. This armor can be upgraded at the Great Fairy Fountain. very nice to know man, i will use it well. It is best to take portion in a contest for among the most effective blogs on the internet. I will advise this site! Can you confirm the cost of the final upgrade? Some sites are reporting 10 silent princess, while others report 3 silent princess. The final upgrade does cost 10 silent princesses. How do you get the rest of the set? I can’t find any info on that. The chamipons tunic is usually paired wit the hylian hood and trousers.